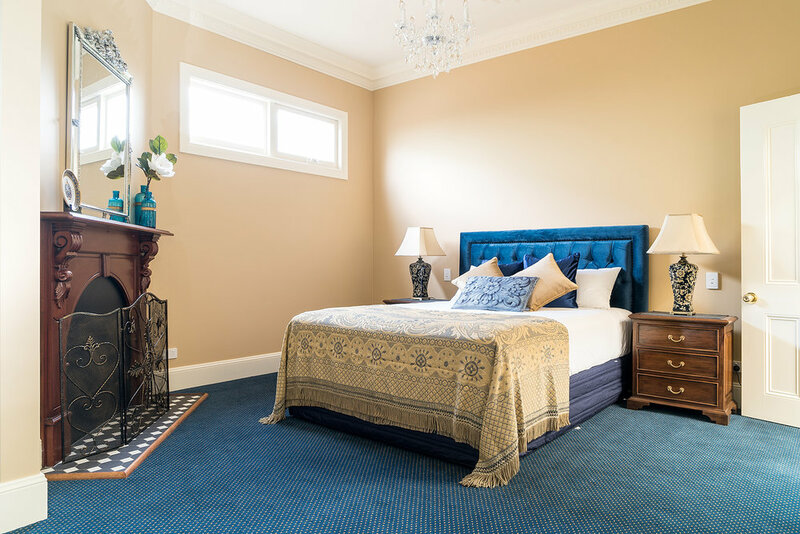 Sympathetically restored in the period of the home, the 'Sapphire suite' is styled in regal tones of blues and gold, and is the perfect companion to the existing Ruby Suite. Both adjoin the sunny conservatory where guests may be served a delicious full cooked breakfast of choice included in the tariff. The suite offers a comfy pillow top Queen size bed dressed in luxury linens, period en-suite with French toiletries, large flat screen smart TV with Netflix, free WI-FI, reverse cycle air conditioner and electric blanket for the cooler months. Period en-suite bathroom with French toiletries and hair dryer. Comfy pillow top Queen size bed dressed in luxury linens. Electric blanket. Large flat screen smart TV with Netflix. Free WiFi. Plush lounge. In-room dining area. Tea and coffee preparation area with refrigerator. Reverse cycle air conditioner. Ornamental fireplace. Ironing facilities.